The production of high-quality knives is a tradition that dates back many years in Japan. Japanese knives are synonymous with sharpness, precision and the elegance of artistic cutting. Zwilling's Miyabi brand embodies these values, time and time again, in knives full of character designed for the most well designed kitchens. Morimoto is a name known to millions for his star appearances on Iron Chef. He is recognized the world over as an authority on cutlery, and has garnered critical acclaim for his restaurants and cookbook. Now he brings his years of experience to bear on a signature knife line that meets his high expectations. 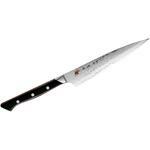 This series is ideal for the preparation of any dish that requires precise cutting. In Japanese cuisine the aim is perfection. Dishes must be prepared according to the rules of the art. They must delight the eye just as much as the palate. Perfect meals require perfect tools. FRIODUR ice hardened blades made from corrosion-resistant Zwilling J.A. Henckels special formula steel. CRYODUR blade, hardened using a specifically developed process that guarantees extreme hardness. I purchased this knife last year. I have William Henry, Boker, Shun, kitchen knives as well. Comparing the Morimoto to William Henry quality is apples vs. oranges, but for how much knife you get for the price the Morimoto is extremely impressive. The Morimoto 8" knife is the one I use the most of all the rest of my knife selection. 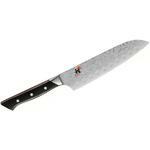 After using the Morimoto for over a year I have found it maintains a extremely sharp edge, it is comfortable to use for lengthy chopping chores, and is a very versatile addition to the kitchen. I highly suggest this knife to anyone serious about cooking. The Morimoto is one of my top three kitchen knives I own. It's a nice looking knife, if a bit garish.If you're thinking you're getting a $200 knife for $100 you are mistaken, this is decent quality steel but the fit and finish is just not there. Mine has problems with handle construction being sloppy (uneven layer thickness, no final sanding pass so the metal protrudes from the handle material).This is probably a $90 knife at most.NOTE, it does not say made in Japan anywhere on the box or the knife itself. "Each blade is finished by master craftsmen in Seki, Japan" maybe the blade but not the rest of the knife, there isn't a japanese craftsman in existence that would have let this leave the factory. I used the knife to cut meat and vegetables. it has helped me more than the previous knifes . I love everything about it. looking forward to invest more on the same brand of knifes. Hey, I wanted to share "Zwilling J.A. Henckels Miyabi Fusion 600D Damascus Morimoto 8 inch Chef's Knife" with you from KnifeCenter.